DigitalFace has released the jasperoo code to the community under GPL3. There are still features missing, and a few little bugs, but I didn't want to work on it any longer without checking it into source control, and since I planned to make this a open source project, I figured that now is the time for its release. 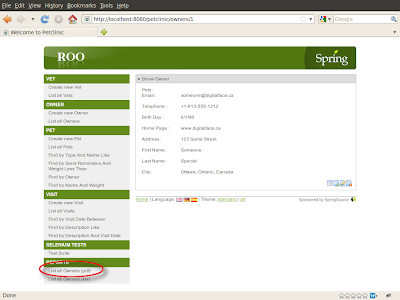 What is jasperoo, and why should I care? If you don't use Spring Roo, then you probably won't care... just carry on with your life. 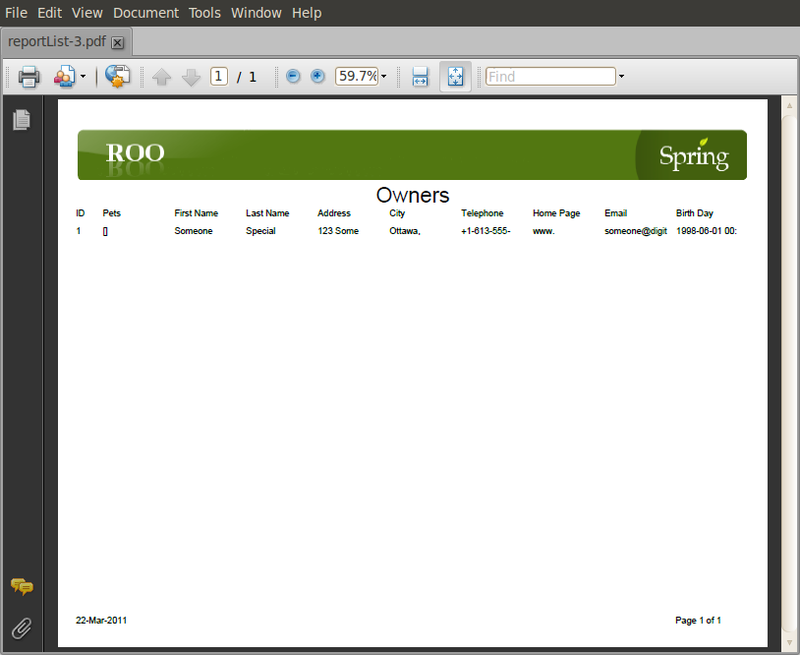 If you have started using Spring Roo (or if you've been reading my posts lately), then you already know that it is very powerful for quickly stitching together the components needed for Enterprise Java applications. 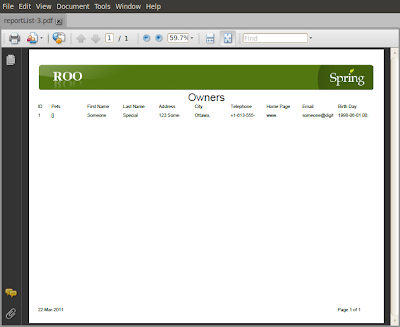 Jasperoo facilitates the integration of Jasper Reports into your Spring Roo applications. Ok... here we go. I will assume that you have already setup Spring Roo, and familiarized yourself with it. If not, go to the Spring Roo website for instructions. 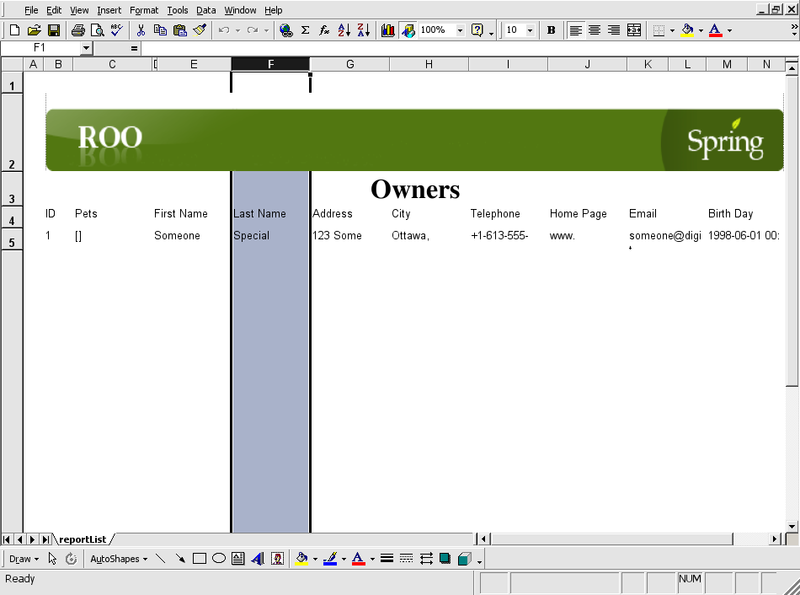 Step 1 - Create a sample application. Step 2 - If you already have an older version of jasperoo installed do the following, otherwise, skip to step 3. There... that wasn't so hard, was it? Now either exit out of roo, or open another command shell and start-up the Pet Clinic application. 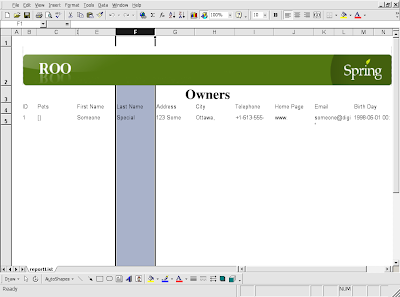 Open the report in Adobe Acrobat or some other PDF viewer. The reports generated are very utilitarian. However they can be readily edited in iReport. The same code produces pdf and xls files, and with a small change to the menu file you also get csv, html, odt, xml, and rtf formats. So, I encourage you to download it and try it out. The project is hosted on Google Code: jasperoo.digitalface.ca.